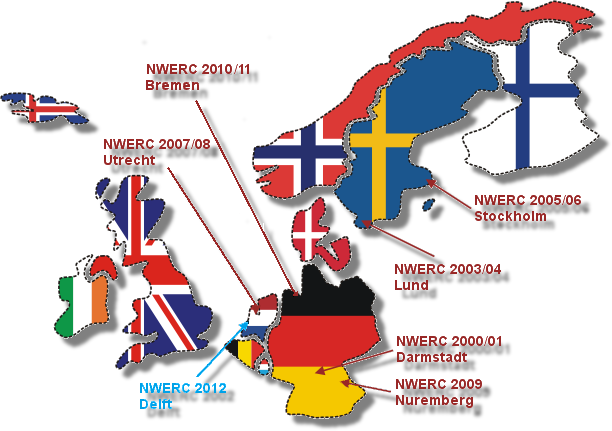 Welcome to the website for the North Western Regional Programming Contest 2012 (NWERC). The NWERC 2012 is hosted by the Delft University of Technology and will take place from the 23rd of November until the 25th of November. Results, pictures and problemset are available here. 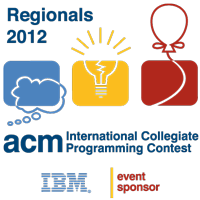 NWERC 2012 is integrated in the ACM International Collegiate Programming Contest. It draws students from colleges and universities throughout Belgium, Luxembourg, Great Britain, Ireland, Iceland, Norway, Sweden, Finland, Denmark, Germany and the Netherlands. The winning team will advance to the ACM Programming Contest World Finals to be held in St. Petersburg, Russia in 2013, where it will compete with other student teams from other regional contests that have taken place on all continents.